"La Grande Villa" is a brand new villa (350sqm) planned for large families and friends, up to eight persons, with three large beach and sea facing bedrooms. 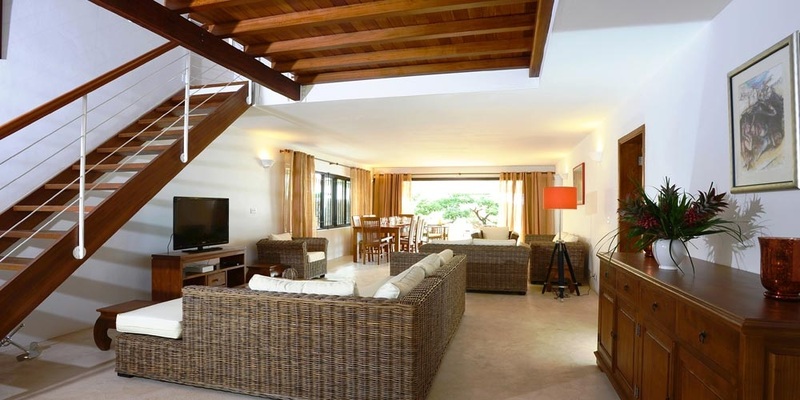 On ground floor the master bedroom (25 sqm) opens on the terrace and swimming pool. With double bed 200x200, large wardrobes, TV, DVD, satellite channels and mini bar, plus an additional dressing, en-suite double bathroom with shower, hair dryer and independent toilet, it offers comfort and generous space. It opens onto the front open terrace and a salt water swimming pool. LCD TV, DVD, and English and French satellite channels. Telephone and Wi Fi are available. The kitchen is fully equipped with double door fridge, wine cellar, electric oven, gas cooker, dishwasher, microwave, toaster, coffee machine and all necessary mixers and utensils plus a barbecue for eight persons. 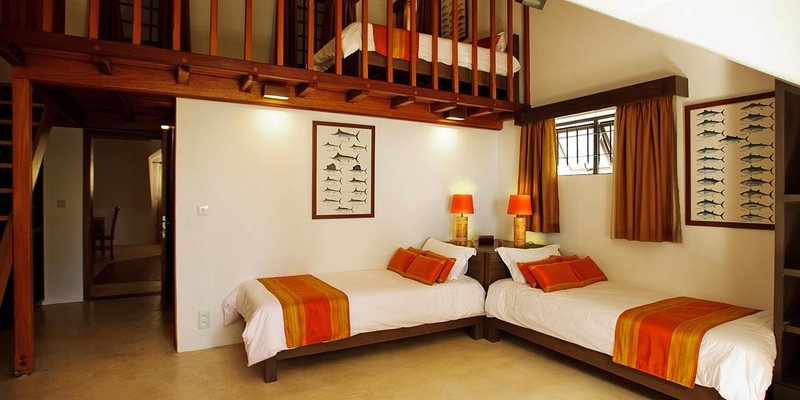 The laundry is equipped with washing machine and tumble dryer plus all necessary equipments. 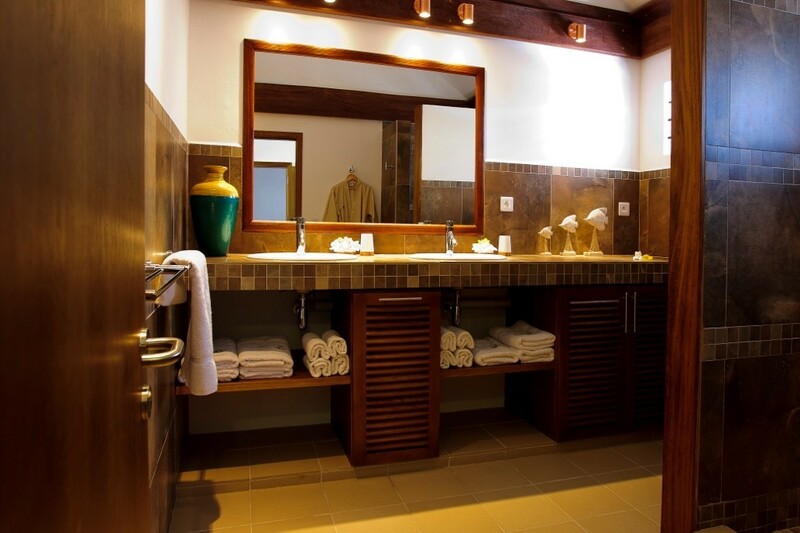 All linen and towels are supplied and maintained. One hair dryer is available in each bathroom. 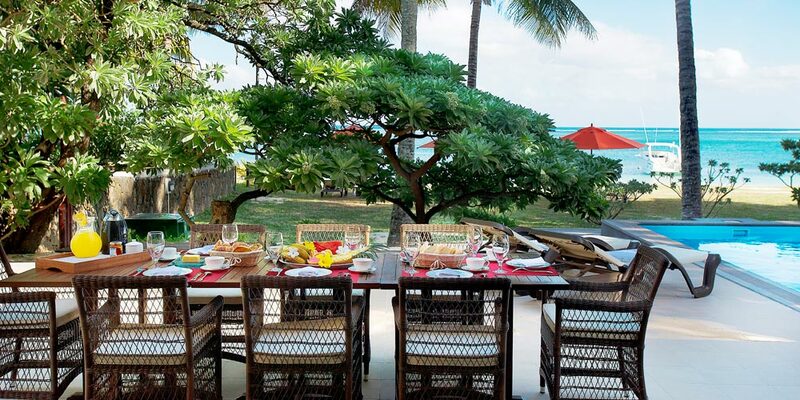 Outdoor wooden tables and chairs are available on the front terrace. Three large 4m sunshades are available on the beach in front of the pool, together with eight deck chairs that can also be used on the terrace. On first floor the second bedroom (25sqm) with double bed 180x200, wardrobes, TV, DVD and mini bar plus an additional dressing, en-suite double bathroom with shower, hair dryer and independent toilet (18sqm) offers plenty of space and a magnificent view on the beach and lagoon. Also on first floor, the children bedroom with mezzanine has four single beds 90x190, wardrobes and en-suite double bathroom with hair dryer, shower and toilets. Master bedroom 1: Ground floor, pool and sea facing, 25 square meters, double bed 2,05m x 2,0m , mini bar , Led TV + Satellite TV channels + Blue Ray DVD, double wardrobe plus independent dressing, en suite bathroom with two wash basins and large shower. Independent toilet. 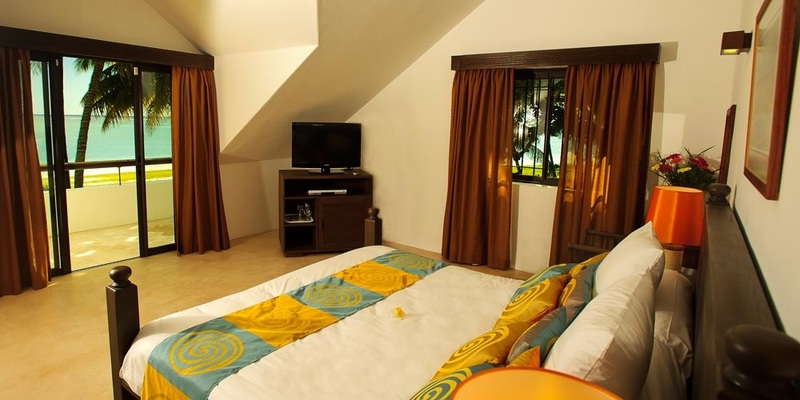 Master bedroom 2 : First floor, pool and sea facing 25 square meters, balcony, double bed 1,90m x 2m, mini bar, Led TV + Blue Ray DVD, with double wardrobe, plus independent dressing, en suite bathroom with two wash basins and large shower. Independent toilet. Children bedroom : First floor. Pool and sea facing, 19 square meters plus mezzanine 10 square meters, four single beds 90x190, wardrobe, en suite bathroom 10 square meters with double wash basin and toilet. Hair dryer available, towels and soap supplied. ATM, money changers, super market with delivery service, Post Office, Police Station, medical centres, massage therapist etc …. 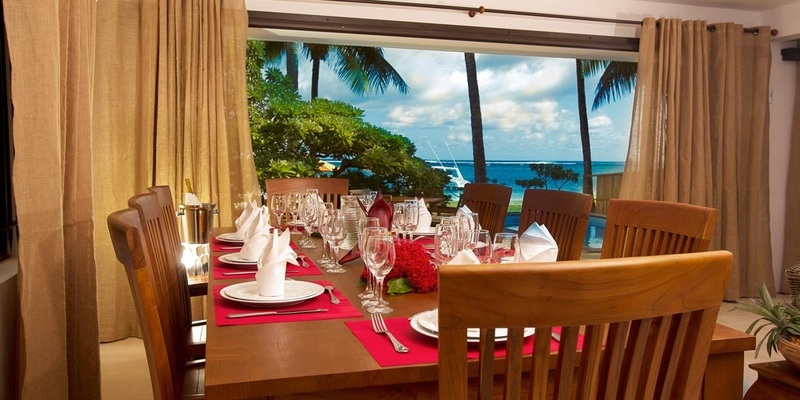 La Grande Villa and la Petite Villa are ideally located and equipped for those willing to spend a holiday time in Mauritius with their family and/or friends in a modern beach villa while having easy and quick access to all required facilities. 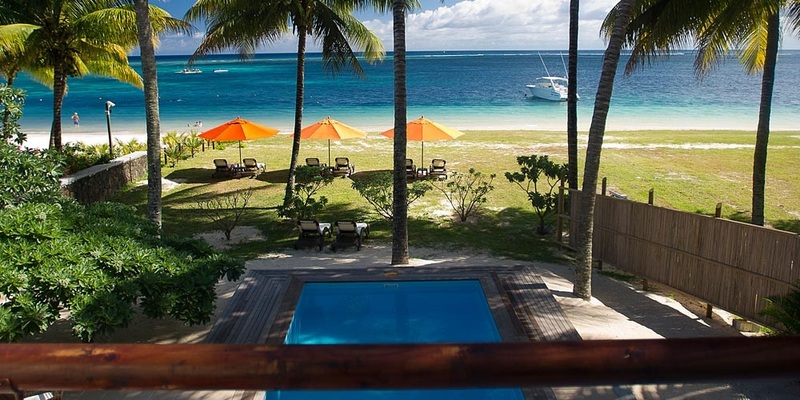 The beach and all water sports as well as fresh fish supply are available in front of the villa in a place protected from the trade winds. Yet, from your holiday villa, small and large shopping centres, restaurants, spas, ATMs, Post Office, banks etc... are available within minutes saving you precious beach time.